I am just wondering if there has been any discussion about a manually controlled pick and place tool. It seem to me that the biggest problem with working with smt components is seeing and manipulating the tiny parts. I think a pick and place tool doesn't necessarily need to be fully automated to be a useful tool. A "print head" with a pick and place tool and a magnified camera and manual control over the axis would allow the human to see and very accurately (and steadily) place solder paste and smt component. This way the human does what it is good at, acquiring information and making decisions, and the reprap does what it is good at, very precise and repeatable movements. Also I think once a system like this is in the wild that development of tools to automate the process would accelerate. If this idea has already been discussed could somebody please let me know, then we can disregard this thread. ... have you seen the attached images in the linked post? 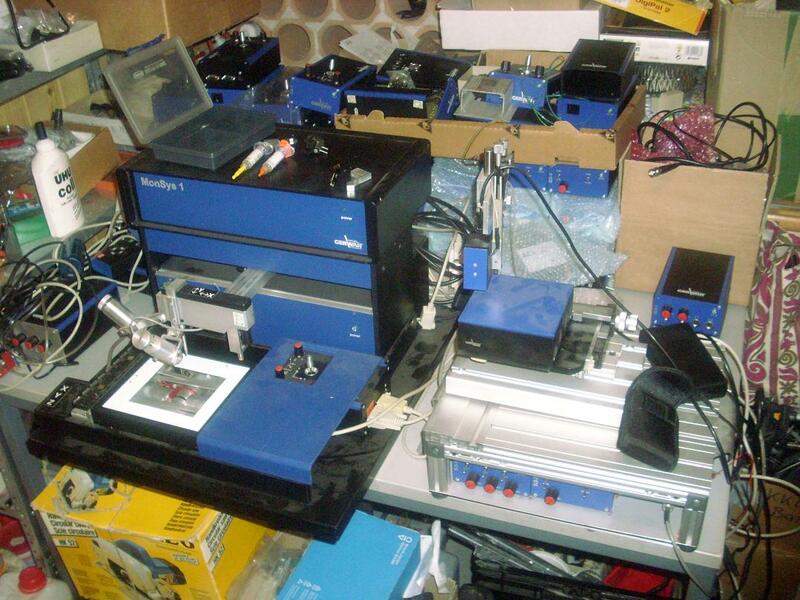 It's the same manual SMT-pick'n'placer - I've only rearranged and repainted it and add two cameras and an additional micro-/nano-XYZ-stage for handling even smaller parts than common SMT components. Edited 1 time(s). Last edit at 03/18/2013 03:27AM by VDX. I have been looking at manual pick-and-place machines. There are a lot of them on YouTube. I have got some ideas from that and designed one myself. It will have a lot of 3d-printed parts, some rods with linear bearings. I will use a USB microscope and a handhold pick-and-place tool I have ordered from ebay. So far I am just investigating. Maybe I will scale it down a bit to make it less complicated. I will not produce a lot circuit boards but a few now and then for my small projects. I attach a picture of what I'm might make. The green square to the left is a hand-rest and it is used for a coarse positioning of the pick tool. The blue linkage is for mounting the pick tool and the camera. This is moved with finger movements only to exactly positioning the pick tool. I will probably use this setup (if it will be built) for adding the solder paste too. To help positioning I will investigate if I can add an adjustable cross to the picture from the microscope that will be entered exactly where the pick tool will go down. Edited 1 time(s). Last edit at 12/18/2013 02:53AM by nof.